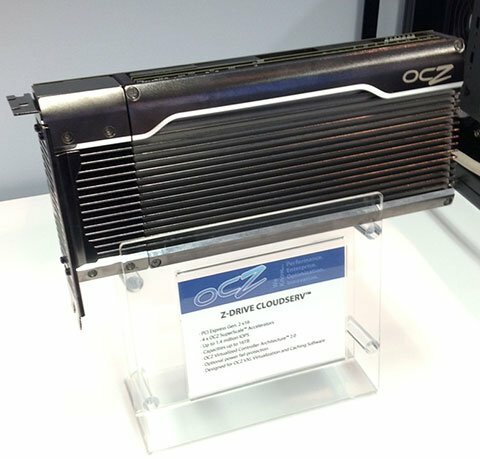 Legit Reviews shot photos of two upcoming solid state disk products from OCZ. First up is the Z-Drive CloudServ, a new enterprise PCI Express part that promises an insane 1.4 million IOPS and bandwidth of up to 6GB/s. The Z-Drive CloudServ put up some insane IOPs (Input/Output Operations Per Second), boasting up to 1.4 Million IOPs performance with the demo at Computex showing 765K IOPs which when compared to any other storage solution on the market is off the charts in terms of performance. CloudServ is capable of hitting up to 6000 MB/s. Also on display was the Kilimanjaro NAND Flash Controller Platform, a native PCIe to NAND solution jointly developed with Marvell. It's world's first PCI Express 3.0 SSD and it will be available in full-height PCIe, mini PCIe, and 2.5" PCIe formats. The speeds each form-factor is capable of are 3Gb/s and 1.8 million IOPs, 500MB/s and 50k IOPs, and 1000MB/s and 100k IOPs respectively. 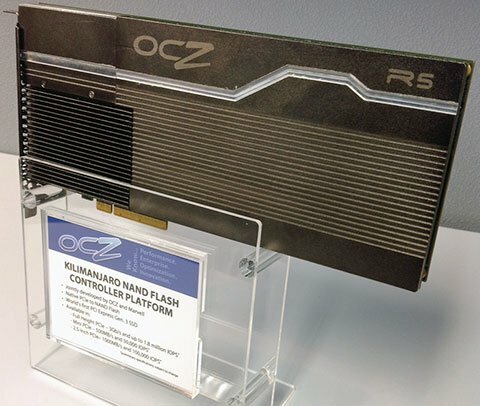 When it comes to PCIe SSDs, OCZ reigns supreme.